Use the Accessories Theme as your 2nd or 3rd Theme. Most buildings on the layout have lights or other accessories to control. To visualize and control this in Rocrail can be done with the Accessory Switch and the new building SVGs from the Accessory Theme. It is easy to create your own buildings as SVG and add them locally the the Accessory Theme. The range from 51 to 60 is reserved for buildings in the Accessory Theme. 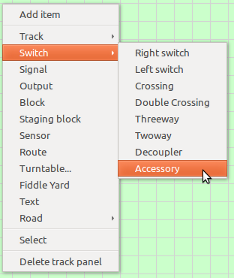 Add a Accessoiry switch type to the layout. Optionally an Address can be set for controlling for example the building lights. The Control option can be used for setting an interval. Alternatively, a building can also be added as Output object with SVG option "Accessory". The Control option of the Switch object is therefore not available. The Action Control State can be set to "none" to avoid activation at left click on the building symbol. The optional Description will be used as menu text if set. Otherwise the action ID will be used.